In the business of trade and commerce, coming in contact with different people happens every minute of every day. Interacting with clients, business partners, shareholders, and suppliers may sometimes lead to the sharing of information that is sensitive or confidential. As a business owner, it is your responsibility to protect your company by making sure that confidential information remains that way. One way to guarantee this is by constructing a Non-Disclosure Agreement, or an NDA. 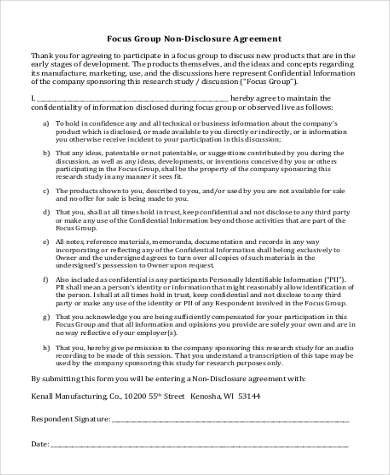 Non-Disclosure Agreements are contracts that take away the liberty of another person or organization to disclose information that is confidential and affects the business’s trade. 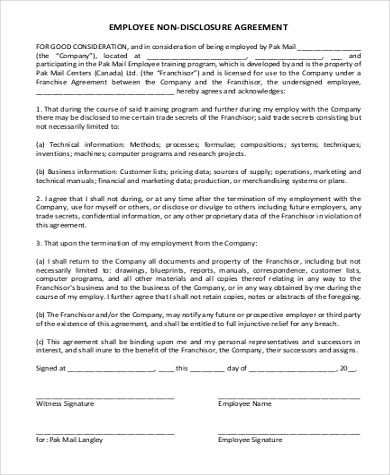 A Non-Disclosure Agreement or a Confidentiality Agreement may sometimes be a portion provided in an Agreement Form, or may also be constructed as a totally different form of agreement. 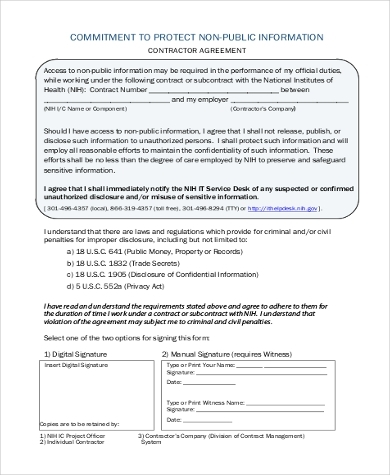 A one-way NDA, also called a unilateral non-disclosure agreement, is a type of agreement that is used when only one organization or party has access to confidential information. 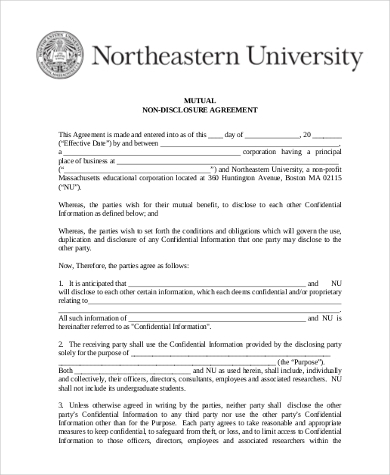 A two-way NDA is also known as a Bilateral Non-Disclosure Agreement. A Two-Way Non-Disclosure Agreement is created when two or both parties are at risk of having confidential information divulged. 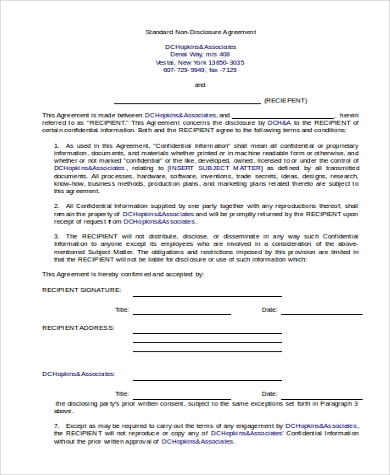 This type of Non-Disclosure Agreement is commonly used in mergers or in partnerships. Some proprietors or organizations, however, will typically opt to use a Bilateral NDA in anticipation of having to eventually divulge confidential information in business transactions. A Multilateral NDA helps to protect everyone’s interests when there are three or more parties involved. A Trade Secret is anything that is used in business which has an independent economic value as long as it is being kept from the public. Examples of trade secrets are recipes, documents or material, inventions, or even a list of client information. 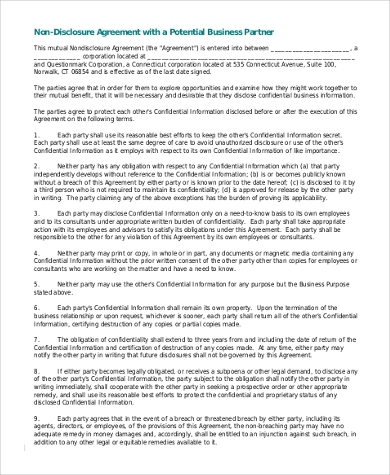 First of all, a Non-Disclosure Agreement Form must contain the name or a list of names of individuals who are expected to come into contact with the confidential piece of information. 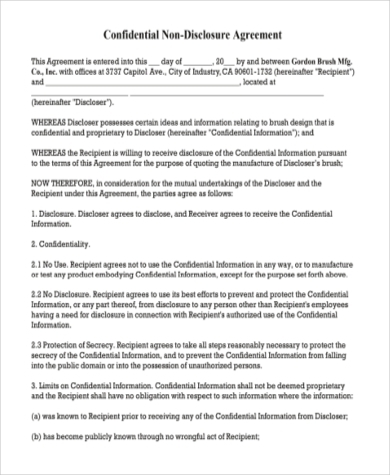 Your Non-Disclosure Agreement should outline the type of confidential material involved, along with the proper indication of the sensitivity of the information. An NDA may also include a consent clause that will hold the agreement null and void in times when information is required by law or in a judicial process. 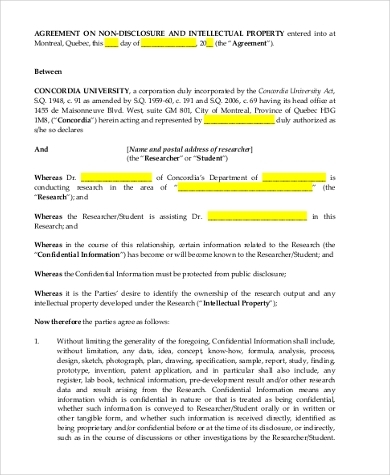 Non-Disclosure Agreements are contracts and are therefore legally binding. Having established that, the breach of a Non-Disclosure Agreement can be used as a basis for legislative procedures, and the violator can be sued for damages. Think of Non-Disclosure Agreements as a security blanket for both big and small business owners. The information you retain in your company should be considered an asset to keep your business afloat. The forms we have provided above come within quick and easy access, are downloadable for you to customize, are printable, and tailored to fit your varying NDA needs.